Today Jen is talking to Teresa Heath Wareing, a friend she met sitting in the front row at Social Media Marketing World a couple of years ago. As a fellow front-rower and marketing expert, she and Jen talk all things email marketing. If you read that and thought, email marketing, who does that anymore, then this episode is especially for you. Teresa explains she talked a good game but didn’t always follow through. Sound familiar? Jen and Teresa dive into what’s working now (you need to hear this) and what’s not working. Teresa shares 4 key questions to help you target your audience, so they absolutely love seeing you in their in-box. With examples! 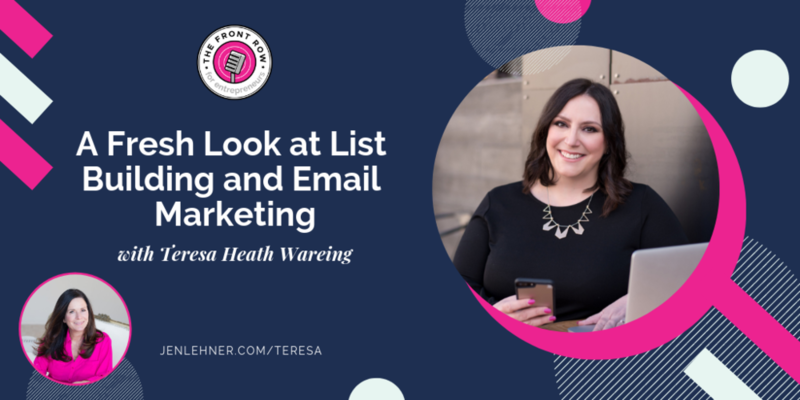 Teresa shares in true confession style what not to do, and her biggest regret when it comes to email marketing. This is so many of us and her story will help you realize that you have what you need to use this as part of your marketing strategy.